The new pygmy goat society that has been recently set up has no connection whatsoever with the Pygmy Goat Club which remains, as it always has been since its foundation in 1982, the official body for the breed in Great Britain. The Club manages the only recognized registration system for pedigree Pygmy Goats. The Pygmy Goat Club AGM will be held on Sunday 28th April 2019 at Crewe Hall, Crewe starting at 11.00 am. For those wishing to attend, booking numbers and payments for the buffet lunch (£8 pp) and Special Dietary Requirements need to be sent to the Secretary, Wendy Kinsey by 6th April. The Goat Veterinary Society Spring meeting is to be held at Haydock Racecourse on Thursday 16th May 2019. For details of all 2019 shows holding Pygmy Goat classes look under the Shows menu and Forthcoming Shows. PGC Booklet "An Introduction to Management and Breeding"
BIS & Res' BIS National Breed Show 2018. 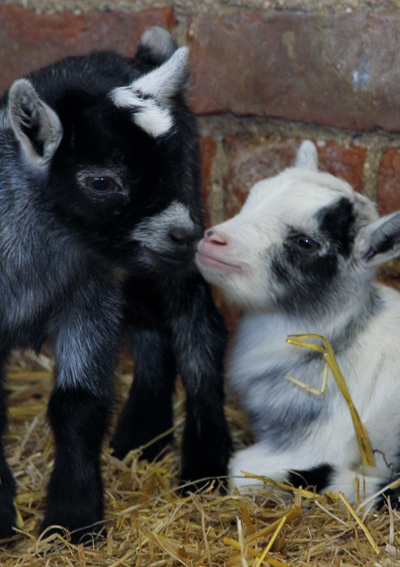 Welcome to the official website of the Pygmy Goat Club of Great Britain. This is the main hub of information for anyone interested in the wonderful pygmy goat. Whether a pet keeper, breeder or exhibitor, this website aims to assist, educate and provide contact details for the PGC officers and advisors. If you cannot find what you are looking for here, or have suggestions for improvements or additions please contact us - click here. Obtain and exchange information via the quarterly magazine “PYGMY GOAT NOTES", the PGC website and social media forums. Register herd names; enter Pygmy Goats in the PGC Pet Record; enter qualifying goats in the PGC Herd Book. Attend PGC meetings and exhibit at shows. To abide by the rules of the Club. To always behave ethically and present a positive image of the Club. To consider the welfare of my goats and the best interests of the breed above any personal gain or profit. To be honest in advertising and record-keeping/registration of stock. Copyright of the PGC Logo is held by the PGC National Committee. Use of the Logo by any person or organisation is not permitted without the written consent of the Committee. A new data protection law is coming into force on 25th May. We want to make sure that you know what data we hold and how we use it. Below you will find a statement about what we’re doing to ensure that we comply with the new General Data Protection Regulations. The Pygmy Goat Club collects Date of Birth for under 16s to confirm Junior Membership status and Date of Birth is not saved on the database. Members have the option to create an account by requesting a User Id to access the Members Login on the Pygmy Goat Club website and this is password protected. We do not collect any personal information on visitors to our website who do not create an account with us. The Pygmy Goat Club does not collect any non-business-related data or sensitive personal data from visitors to our website. During shows and events, we may take photographs of the participants and their goats. We will be seeking permission from you to use these images. The Pygmy Goat Club may process your information for direct mailing purposes in the legitimate interest of itself and members e.g. sending membership renewal reminders, communicating about a goat related issue e.g. Johnes disease, updating members in connection with a Pygmy Goat Club event, or making contact about a specific member query. Regional advisors may use the information to contact individuals regarding events within their region. The Pygmy Goat Club may use your photograph in printed publications including those produced for promotional purposes, on our respective websites and social media pages, in local newspapers and in television reports on media websites. The Pygmy Goat Club endeavours to provide the most accurate information possible. Therefore, we seek to re-verify the accuracy of all of the information on an ongoing basis and we check contact details annually. We do this by requesting contact information at annual renewal. Data that is found to be inaccurate, out of date or not supplied is updated or removed from the database. With respect to the information the Pygmy Goat Club possesses about you, you have the rights of access, rectification, erasure, and restriction. You also have the right to object to processing. You may exercise any of these rights by contacting the Club’s Secretary at the addresses shown in the quarterly magazine ‘Pygmy Goat Notes’ or on the website www.pygmygoatclub.org.uk . You may request access to the information we have about you. You may also request the correction, amendment, or deletion of any information about you that is inaccurate, and you may request for you information to be deleted. The Pygmy Goat Club will treat requests for access, correction, amendment, or deletion of information in accordance with its internal policies and applicable legal requirements. If you feel that we have not complied with your requests, you have the right to lodge a complaint with the appropriate supervisory authority. The Pygmy Goat Club maintains suitable safeguards, including reasonable physical, administrative and technical safeguards to protect its database from unauthorized access, disclosure, alteration or destruction.